A national park in Vienna, VA. It features several venues onsite, most notable the Filene Center which is a 7000 seat amphitheater. Performances include national music acts, operas, the National Symphony Orchestra, musicals, and music festivals. Patrons are allowed to bring blankets, chairs, food and drink, including alcohol, onsite to enjoy a picnic on the lawn. Has a small enclosed venue called the Barns for performances in the winter months and a small amphitheater in the woods for kids shows. For weeks I have known about John Medeski playing a solo show at The Barns. Medeski, Martin and Wood is my second favorite band so I knew what to expect seeing Medeski solo. I have seen the Wood Brothers side project which is different then a MMW show. 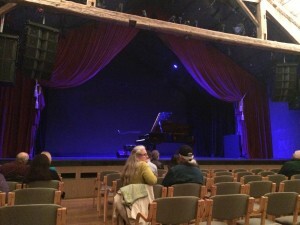 I was expecting him to play a grand piano and this is what I saw on the stage when we arrived. In 2005 I saw MMW play at the Newport Jazz Festival, Medeski had his normal setup but he did play the grand piano they had on stage and that was awesome. I managed to convince Nancy to come and she suggested we invite my Dad and Pat, they accepted. The two of them normally go out to dinner on Thursdays so it worked out for all of us. I got to see John Medeski and everyone else got a nice evening together as a family. Pat got tickets from the box office and she found a close restaurant to have dinner at, Maplewood Grill. This was a great classic American restaurant. The decor was nice but the crowd was definitely an older one. If you are young and looking to meet people, don’t come here. I had the chipotle and Guinness braised beef short ribs and they were amazing. The beef was cooked perfectly and the sauce was rich. It came with bacon risotto which was good, it was the beef and the sauce that made this dish. We arrived at the venue just in time to grab a drink and take our seats. Since I had never been here before I was astonished at the inside. It is exposed beams from a 1730 German barn originally built in New York, pretty cool. There is a loft that seats close to 100 and the acoustics are pretty good in the space. I don’t know if this is because of the wood beams or because it is so small. Certainly for the Medeski show, the grand piano didn’t need any amplification and the sound was clear. Medeski came on stage at 8:05 and only had a simple greeting. He then proceeded to play for 60 minutes straight without a break. I must be honest, his playing that night was a little weird. He would noodle for a few minutes and then go into a partial tune, back and forth for the entire hour. His noodling was crazy and at times made no musical sense. The transitions often didn’t make sense and I felt it ruined the flow. He would bang on the keys and sometimes even pluck the strings directly in the piano. It was a weird set and I could tell that Nancy and Pat were getting lost. Nancy was ready to go shortly after the set started. He closed the show with a MMW song that was good but this was decidedly a Medeski show. He took us on a musical journey all over the place, sometimes I got lost and wanted to get off. After the show we all agreed it was interesting. 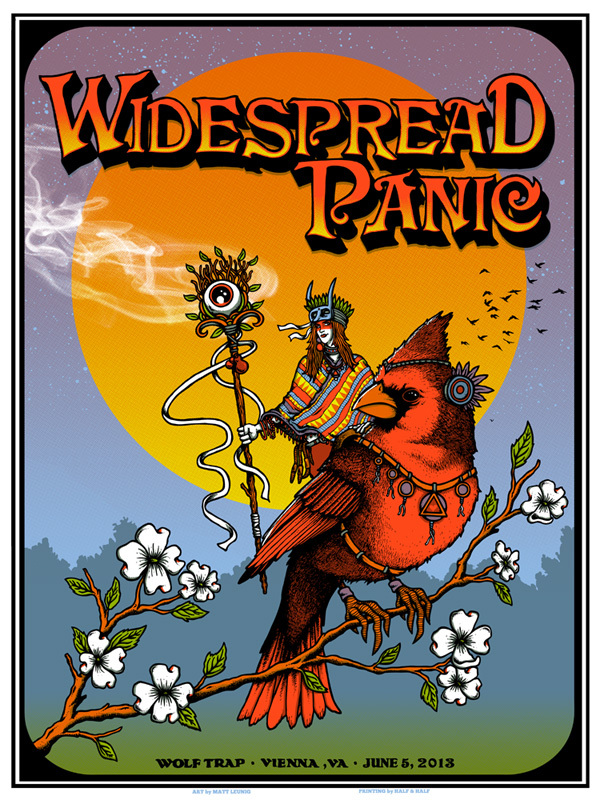 Pat and Nancy didn’t care much for it and even for me, a fan of Medeski, it was a hard show to fall in love with. I liked the solo piano idea and at times he would really jam. Often weird noodling that didn’t make sense or flow and was hard to follow. My dad and I understood what Medeski was doing and as a musical performance, it was something different and new. Personally I can’t wait for the next Medeski, Martin and Wood tour to start. Last night had to be one of the hottest day’s of the year so far. There were record heats across the state with heat advisories from the National Weather Service that basically said “stay inside if you don’t have to go out.” So what did Nancy, Matt and I decide to do…….go see Sweeney Todd at Wolf Trap. We actually planned this out a few weeks ago so we didn’t know what the weather was going to be like the night of the performance. My crystal ball can be a little fuzzy that far into the future. We first planned to get some snake food, a few six packs, and camp out on the lawn till the performance started. As the day approached we got a better idea the weather was going to be hot and humid, we adjusted our plan a little. Instead of arriving early for a picnic we stopped by a pizza shop in Vienna for food. We first tried Whole Foods but it was a bust, they don’t have the eateries like the one in Fair Lakes. The pizza place was over priced and the waitress screwed up Matt and my order. Ugh, the night was not starting off well. To raise our spirits a little we headed over to Norm’s to get some beer for the evening. Matt picked out A Little Sumpin’ Sumpin’ Ale (Lagunitas Brewing Co.) and Nancy got the Longboard Island Lager (Kona Brewing Co.). When we got to the venue I was a little discouraged, I thought the heat would keep most people away but the overflow parking lot was pretty full. As I picked up the tickets from will call the warning bell rings letting us know we should be taking our seat shortly. Finding a seat on the lawn this evening was rather easy despite the full parking lot. 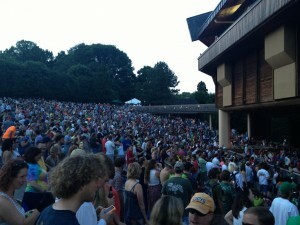 The last time Nancy and I saw a show at Wolf Trap, Mamma Mia, the lawn was smashed and we were packed in like sardines. Tonight’s performance had plenty of open space for us to spread our blanket and enjoy the show. The National Symphony Orchestra was in hand to perform the musical score for the evening and they where already on stage tuning and getting ready for the night. Within a few minutes the conductor walks in stage followed by the extras. The stage setup was rather sparse, the orchestra was setup in the back of the stage with the rest of the “set” in front. I use that term loosely as the set consisted of two simple raised platforms and about a dozen red chairs setup in various spots on the stage. The chairs where the major set design for the evening, providing most of the scenory and setting up the various locations needed for the play. The only other major prop on stage was a window that dropped from the ceiling to represent various rooms in the play. Above the stage was a giant screen that would display various pictures to help tell the scene location, could be the streets, the barber shop, or sometimes blood strewn when someone died. Not much in the way of stage design. The entire play had this feel of scarcity and simplicity that is hard to described. There were very few props throughout the entire performance. A table here and there, the barber chair, the giant window. During scene changes the extras would pick up the chairs and move them around the stage, rather bizarre when you see it. As for the costumes only the main characters had anything close to original outfits, all the extra were dressed in similar plain cloths. From what I could gather this minimal stage presence was because the play was being put on by the Wolf Trap Opera Company, not a nationally touring troop. What they lacked in set design they more than made up for with their acting/singing ability. All told the show was about 2:30 hours long. Thankfully as the show progressed the temperature dropped but our sweat soaked cloths from earlier prevented us from cooling off. Despite the heat we were not disappointed, enjoying a great evening out on a Friday night. 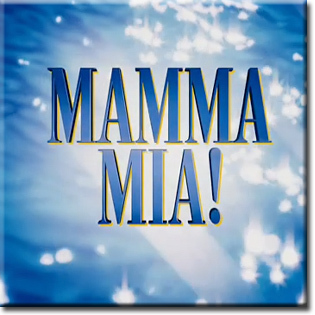 Last night we trekked out to Wolf Trap to see the opening night of Mamma Mia. We got half price lawn tickets about 6 months ago so we of course had not idea what the weather was going to be like. Fortunately the weather ended up being perfect unlike last years were it was incredibly hot and humid. Because of the nicer weather we didn’t drink nearly as much wine to cool off. I could actually remember more of the show this year, but it certainly was just as fun. There was zero humidity and the temps stayed in the low 70’s all evening. It took over an hour to get from Springfield to the venue so when we arrived the lawn was absolutely smashed with blankets. We fortunately snuck our way into a close spot stage right as a group was headed into the pavilion for the show. We spread our blanket and took up residency for the evening. Quickly we got the food out and cracked open a bottle of wine just as the stage lights dimmed and the show started. This year the entire cast changed with maybe the exception of Rosie and Tanya, everyone else was new and did a great job. There was some debate as to weather the stage setup and even the show itself had changed from last year. I happen to believe that neither changed. Maybe seeing the new cast threw everyone off. Or maybe it was the fact of seeing the show from a different perspective this year, stage right. I know when I sit behind the stage at Phish it certainly appears to be a different show to me. The show was fantastic as always. The weather that night was cool, in the low 70’s all evening and perfect for spend the evening outside. By the time the show ended it was getting a little chilly and I could have used a light jacket. Getting out of Wolf Trap is always a pain even though we waited 30 minutes for the venue to clear out. Everyone wants to head east on Wolf Trap Road towards the toll road so it is a bottle neck getting dumping all the lots onto a single lane road. Eventually we made it to Springfield and stayed for a night cap before heading home to Stafford. It was after 1am before we got home and we both crashed hard. It has been a long week of parties and late nights which finally caught up with me. The only consolation was that Friday’s are usually light on the work load so feeling like crap wouldn’t be that big of an impact on my ability to work. I will say that I was looking forward to sleep on Friday night and not having to wake up early on Saturday. Looks like we might make this an annual tradition. 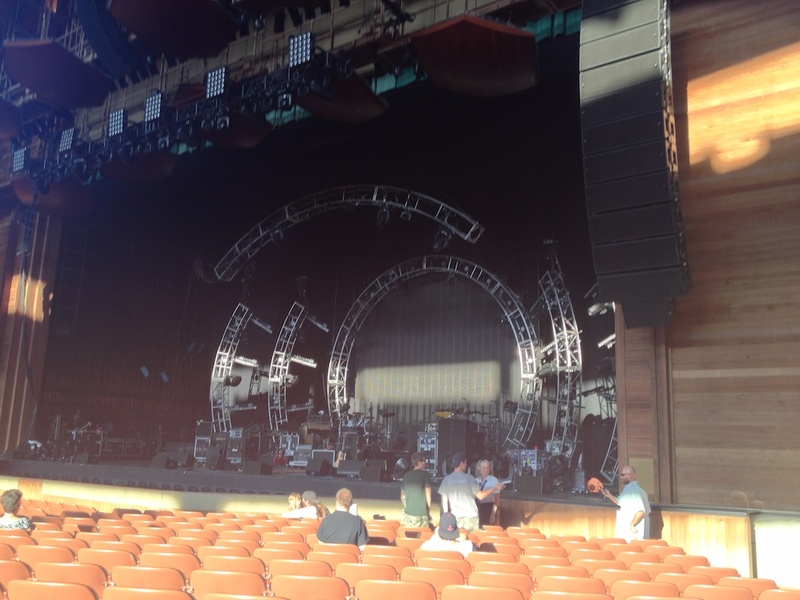 Wolf Trap is such a great place to see a show we talked about seeing other shows together over the summer. Under the stars on the lawn with some food and uh hello BYOB, sounds like a can’t miss evening. 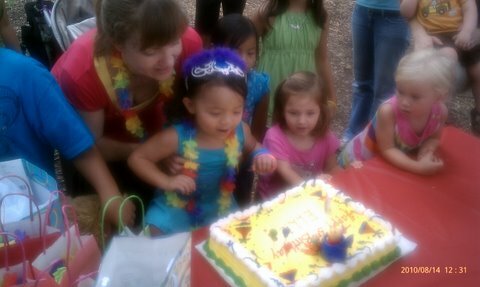 My niece turned three a few weeks ago, two Saturdays ago was the party to celebrate. Wolf Trap has a Theatre in the Woods which holds performances geared towards kids. On Saturday Rocknoceros was playing the final concert of the year and we gathered to celebrate Ellie’s birthday with close friends and family. The show itself was pretty cool, certainly entertaining. As I looked around the venue it was funny to see all these adults and kids rocking out to some crazy music. The lyrics are nothing complicated, teaching kids about the state of Virginia, or counting to 10 on their fingers. After the performance we had a picnic in the woods which was nice. The following week was Pat’s birthday and my Dad planned a surprise dinner for her at the Heart in Hand in Clifton. Pat knew about the dinner, she didn’t know that everyone showing up to help celebrate. By everyone I mean everyone. Bobby, Tracy, Matt, me, Nancy, Stephen and Audry all made it out to celebrate. Nancy and I managed to arrive way early so we bellied up to the bar for a quick drink, shortly after Bobby and Tracy arrived. We didn’t know it at the time, but my Dad got a drive to drop them off at the restaurant. Bobby and Nancy were outside smoking and didn’t see the Lincoln Town Car pull up as the two of them got out, so much for the surprise. Just about the time Pat arrived my brother and his girlfriend showed up. While waiting for Matt to arrive we had another round of drinks before sitting down for some dinner. The food there was great, the restaurant is certainly rustic on the inside and rather empty for dinner. Besides our party of nine, there was only one other group seated for dinner. Around 8:30 there was a live band and the bar area started to fill up quickly for that. The locals don’t eat there, but they certainly use it as a watering hole. After dinner I spent most of my time outside catching up with Stephen. I don’t see him enough so when we do meet up I have a lot to talk about. After disappearing for a while we decided to head back in, I was hoping to get one last class of an excellent Chilean wine, but the ladies polished the bottle off right proper. After dinner we debated what to do next. Bobby and Tracy didn’t have the kids, Nancy and I wanted to have a little more fun, plus it was a Friday night. No sense in turning in early on a weekend. We quickly made a call to Lulu Cafe to see if they had any private rooms available for a little karaoke action. Surprisingly they had room for us so we quickly went from Clifton to Centreville to sing our hearts out. We lost Stephen and Audrey but we managed to have a great time singing to classic songs everyone knows by heart but wont admit to knowing. Late into the evening it was time for everyone to head home. 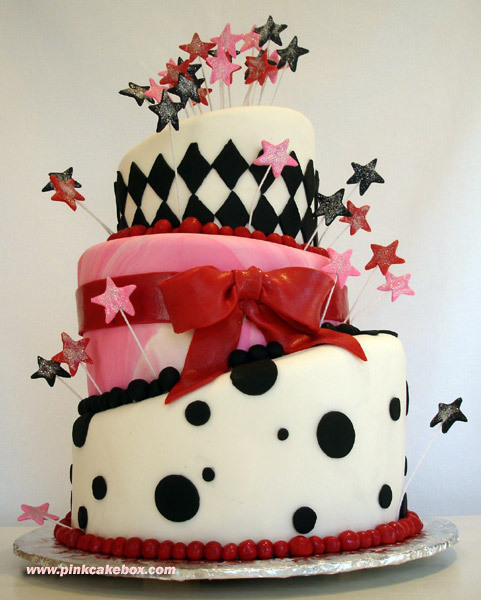 The following day was the last celebration for the week, for Nancy and I. Her sister’s birthday was coming up on Monday so we took her to dinner Saturday night. Her husband was in New York with his daughter and Maggie’s kids were with their father, she was all alone and we couldn’t have that. She almost didn’t want to go out that night, but we twisted her arm to go to Bone Fish just down the street from her house. We had a great time over drinks and a well prepared dinner. Afterward, just like the two other birthdays this week, we headed out for drinks. We didn’t go anywhere special, its cheaper to drink at home, so we opened a bottle of nice wine and settled in for a few hours of conversation. In the span of seven days we celebrated three birthdays from the very young to the young at heart. Each party was a blast and a chance to catch up with family and friends, some of whom I don’t see often enough. I can’t remember the last time so many birthdays happened so close together. Makes me wonder who’s birthday it is next? I feel like a little partying!